Yeah. Part of my food recovery is to be HONEST with myself. And YES. Today I must come clean. I ate an ENTIRE PIZZA. Did I want to share? Do I have another pizza for myself that I won't share? YES. Now BACK OFF BARBIE. 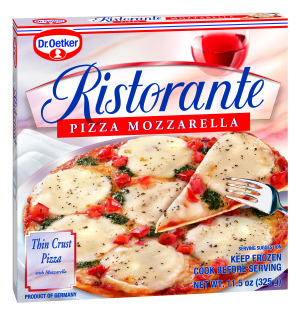 So I tore apart took part in a review taste test if you will of Dr. Oetker Ristorante Pizza. It was tasty. Obviously, if I didn't share. It was very crunchy which is a necessity of mine when it comes to pizza. I LOVE thin crust and the crunchier the better! There are many great varieties that THANKFULLY I don't have to say out loud. My Italian is horrendous! Ristorante Speciale, Quattro Formaggi, Ristorante Spinaci, Ristorante Mozzarella, Ristorante Funghi and Ristorante Vegetale. Leave a comment telling us what you REFUSE to share with your family. (Come on...we ALL hide SOMETHING tasty!!! lol) And a winner will be picked at random on March 9, 2010. DISCLOSURE: This is a sponsored post with TheMotherhood. But all opinions are my own. After all, who would REALLY admit they ate the ENTIRE pizza?? ?